I remember making a dessert like this with my mom when I was little. We made it both with pudding and with jello. I decided to see if I could replicate it the jello one for SCD. 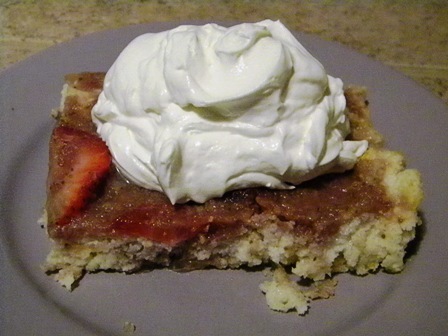 I used my SCD Angel Food cake as my base, but you could also use a regular almond flour cake. I just wanted to have something light. Spray 9 x 13 cake pan with a little oil. Prepare Angel Food cake batter. Instead of a cupcake pan use a 9 x 13 baking dish. The baking time is less for this – about 20 – 25 minutes until top of cake is golden brown and firm to the touch. Allow cake to cool completely – about an hour or so. Sprinkle packet of gelatin over cold water. Let stand one minute. Place pureed strawberries into a medium saucepan and bring to a boil. Stir hot fruit into the gelatin. Stir for about five minutes until gelatin is dissolved. Poke several rows of holes into cake with the end of a wooden spoon – about two inches apart. Slice strawberries. Lay strawberries over cake without covering up the holes. Pour gelatin mixture over cake. Put cake in refrigerator and chill for at least two hours until gelatin is set. When ready to serve whip up some of the yogurt and spread on top of each serving. To whip, use an electric or stand mixer at high speed until yogurt is fluffy – usually takes 3 – 4 minutes. You could also whip up enough for the entire cake and frost the cake with it, but I like to just add it each time. You can store the whipped yogurt in the refrigerator and it will stay fluffy. I haven’t tried making Angel Food Cake with almond flour. it wouldn’t work for a direct substitution because they are just so different.